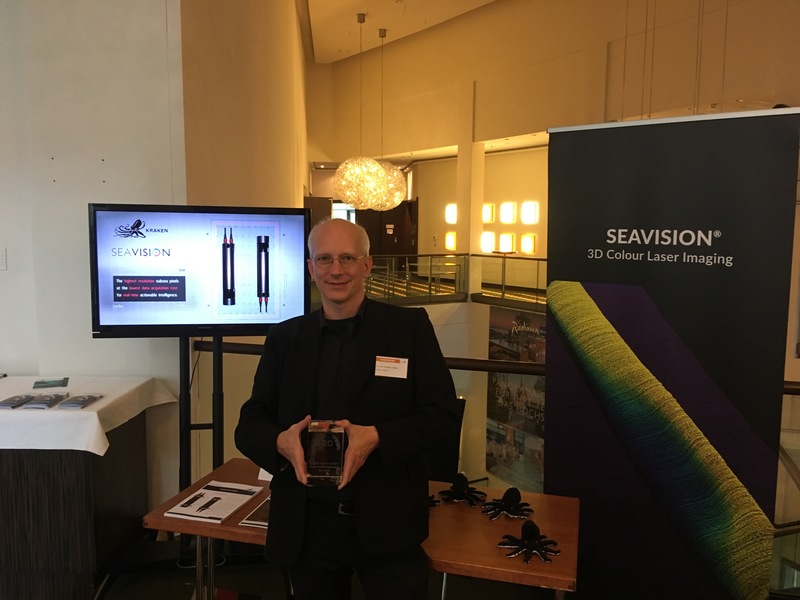 BREMEN, GERMANY--(Marketwired - September 12, 2017) - Kraken Sonar Inc. (TSX VENTURE: PNG) (OTCQB: KRKNF), is very pleased to announce that its subsidiary, Kraken Robotik GmbH was recently awarded the Go-3D prize for Kraken's SeaVision™ system. 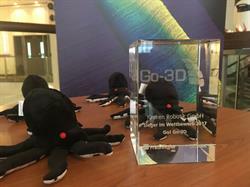 The Go-3D award was established to recognize outstanding technical achievement in the field of 3D visualization. It was presented by the Fraunhofer Institute for Computer Graphics Research in association with BITKOM, the German Association for Information Technology, Telecommunications and New Media. SeaVision™ is the world's first full-color, 3D laser underwater imaging system. Equipped with a high-resolution camera and laser, the system allows users to reconstruct objects on the seabed in such a way that detailed models can be subsequently produced for 3D visualization. Dr. Jakob Schwender, Managing Director of Kraken Robotik GmbH said, "We're very honored to accept this award. Modern technologies for the acquisition, processing and visualization of 3D data have become an increasingly important issue for the design, production and operation of industrial projects. This applies in particular to the underwater maritime industry with its specific requirements for 3D reconstruction." The SeaVision™ system can perform a wide range of underwater inspection tasks with remarkable results. Its 3D imaging capabilities include generation of geo-registered "as-built" models of structures on the seabed or in the water column, survey of subsea infrastructure and comparison against baseline models and detection of structural defects or other out-of-spec conditions that exceed threshold values. When the SeaVision system is combined with an Autonomous Underwater Vehicle, the resulting cost efficiency and accuracy of inspection will exceed anything available today. SeaVision™ was introduced to the marine technology industry in March 2017. Commercial units will be available for delivery during 4Q 2017. Pricing for a complete system will be US$75,000. SeaVision™ is the world's first RGB underwater laser imaging system that offers the resolution, range and scan rate to deliver dense full colour 3D point cloud images of subsea infrastructure with millimetre accuracy in real time. The initial system is designed for deployment on underwater robotic platforms such as Remotely Operated Vehicles (ROVs) and Autonomous Underwater Vehicles (AUVs). The ability to generate accurate 3D reconstruction of underwater infrastructure is an important requirement for commercial, military and ocean research applications. While sonar is the technology of choice for covering large areas, 3D laser systems such as Kraken's SeaVision™ provide significantly higher resolution and accuracy at inspection ranges of under 10 metres. SeaVision™ uses a full colour laser scanning process that's repeated thousands of times per second to generate coordinate values of millions of points on a reflected surface. The coordinates and intensity associated with each reflected laser pulse are processed in real time to generate an ultra high-resolution point cloud. SeaVision produces over 300,000 colored points per second and can reconstruct a 3D object in real-time with typical spatial accuracy of less than 2 millimetres. These datasets can be used to create highly detailed models for 3D visualization, asset management, artificial intelligence and predictive analytics. Unlike other underwater laser scanning systems, SeaVision™ does not have any externally moving parts. It is integrated in a compact twin pod configuration with flexible mounting options and localized auto-calibration. This enables the system to be mounted at-sea without the need for a specialist or technical support. Kraken Sonar Inc. (TSX VENTURE: PNG) (OTCQB: KRKNF) is a marine technology company, founded in 2012, that is dedicated to the production and sale of software-centric sensors and underwater robotic systems. For more info, please visit www.krakensonar.com, www.krakenrobotik.de, www.krakenpower.de. 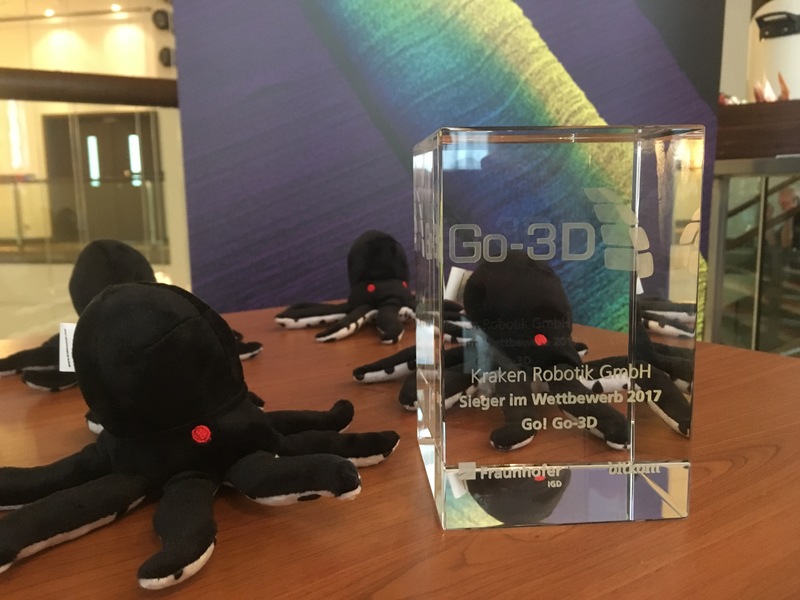 Close-up photo of the Go-3D award surrounded by a support cast of friendly Krakens.